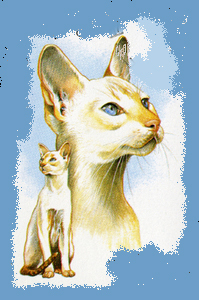 The Colorpoint Shorthair looks very similar to the Siamese. Both are lean, angular, and elegant. In reality, these two breeds are closely related. In fact, the Colorpoint cat is a hybrid of the Siamese breed. The main difference between Colopoint Shorthairs and Siamese cats is the unique point colors of the first. Both breeds share the same physical standard, but where Siamese cats come in four point colors, Colorpoint cats come in sixteen point color variations. In the beginning, however, breeders focused on felines with red or cream on their points (mainly occurring on the face, legs and tails). Indeed, the first color class of the Colorpoints, was red and cream points (also called solid points). Even though the breed was created in the mid 1940s, the Colorpoint Shorthair was not recognized as a breed by the CFA until 1965. These beautiful felines are medium-sized and weigh an average of 7 to 9 pounds. Colorpoints are slim but muscular. Like their siblings, the Siamese, the Colorpoint cat has deep blue eyes and very short hair. In addition to the red and cream points, other Colorpoint variations became popular, including the tabby or lynx points which is recognized by the CFA. This tabby variation has its own color class, which includes blue lynx points, chocolate lynx points, cream lynx points, lilac lynx points, red lynx points, and seal lynx points. Another variation is the tortie point. This variation is also known as the parti-colors class. The tortie or parti-colors pattern is a derivative of the red gene. The tortie point comes in the four Siamese color points. Start with any of the four Siamese colors and then add blotching of red and cream and you have a tortie point. Interestingly, tortie points only occur in females. Colorpoints are very affectionate and loving creatures. They bond very well with every member of the family. They are also very intelligent and active. Colopoint Shorthairs are very low maintenance and don’t require constant grooming. Another point in their favor is that these pointed cats have little dander, so these gorgeous pointed cats a great choice for people with allergies. You will also find Colorpoint Persians (Himalayan cats) and Colorpoint Ragdolls.